Pears on the roadside – Beauty or Beast? 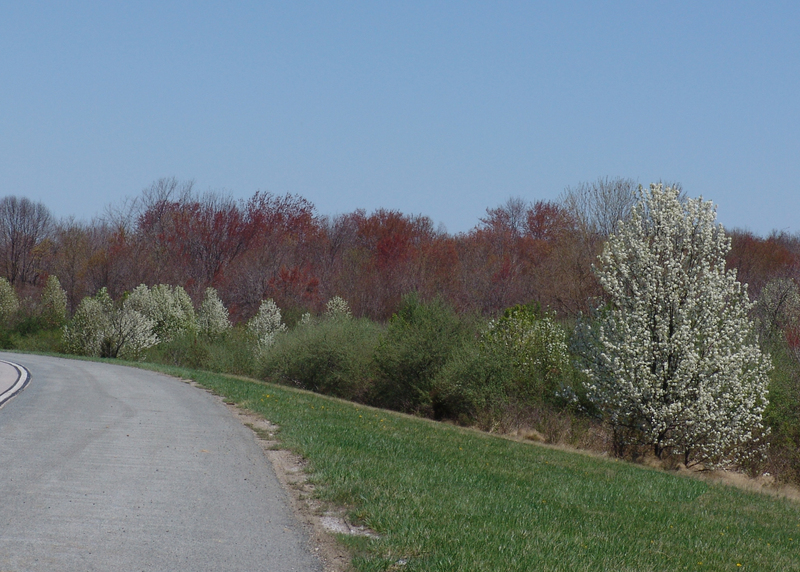 Roland Roth, retired Entomology and Wildlife professor from the University of Delaware, wrote a short piece in the New Journal on Friday highlighting the invasive callery pear that is so prominently blooming on Delaware’s roadsides this April. He said while they may seem pretty, they are crowding out native plants that once existed on natural land in Delaware. He went on to suggest that everyone do their part to cut down invasive plants (especially pears, but also burning bush, barberry and butterfly bush) on their properties and replant with native plants that support native wildlife. Pears along Delaware’s roadside in April. In fact, callery pear is spreading like wildfire on Delaware roadsides. Once we just planted the cultivar ‘Bradford.’ This tree has a nice conical habit, white flowers in the spring and attractive maroon fall color. What is not to like? Well, Bradford pears have a nasty habit of branch splitting when the trees reach about 15 years of age. Large limbs can break out of trees and fall on cars, even pedestrians. This became such a problem that about 10 years ago, Newark removed all the Bradford pears on Main Street and replaced them with other tree species. The nursery industry responded to the problem of weak branches by breeding other callery pear cultivars that have better branch structure. Some examples include ‘Aristocrat’, ‘Chanticleer’ and ‘Redspire’. While Bradford alone produced a small amount of fruit, the fruit production of callery pears skyrocketed with all these new cultivars for cross pollination. That is when callery pears started escaping into disturbed areas along our roadways and crowding out native species. At one time, not too long ago, when you drove past a wooded stretch in Delaware and saw a white tree blooming at the edge of the woods, you could be pretty sure it was a serviceberry (Amelanchier canadensis), a beautiful native trees sometimes also called shad bush; and you knew the shad would be running on the Susquehanna. Now, there are few serviceberries remaining and LOTS of callery pears.